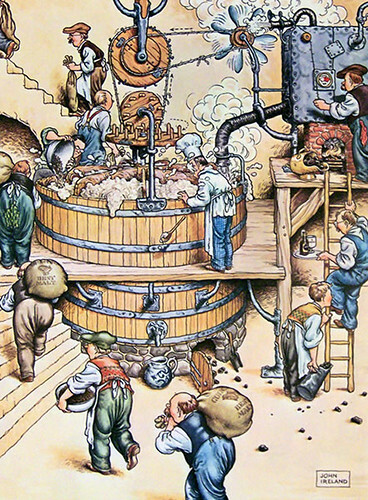 In honor of labor day, here’s a fun series of illustrations showing all the labor necessary to make beer, in this case Guinness. 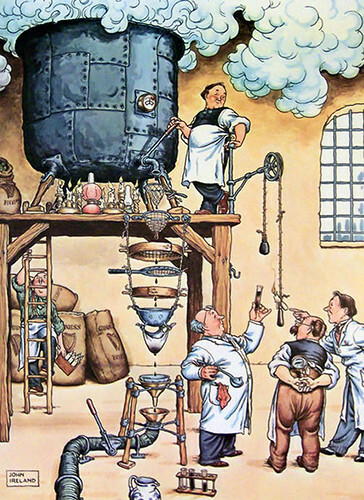 In 1981, Guinness commissioned British illustrator and artist John Ireland to create twelve paintings whimsically depicting the steps that go into making Guinness beer for a calendar. John was born on the 19th March 1949 at Aldershot Hants and attended Farnham Grammar school, Farnham Art School and finally Ravensbourne College of Art and Design. He lived and worked in London from 1971 until moving to Norfolk in 1976. 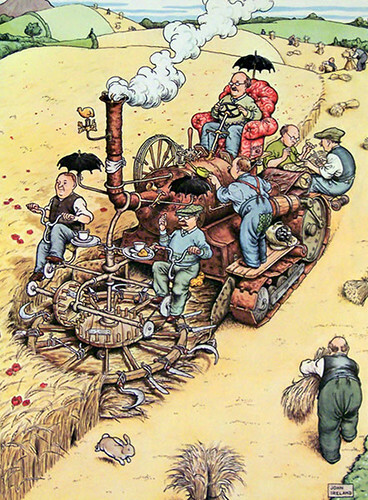 John has two sons, two sheep, a dog and a wife Tessa and has worked as a freelance illustrator since leaving college, principally for magazines and publishing, with a little bit of advertising. In recent years. 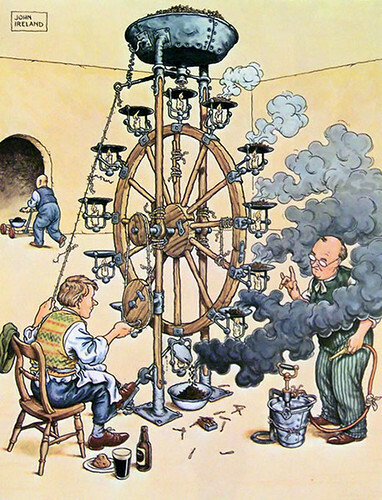 A lot of his work has involved caricatures including collections of sporting personalities and a weekly drawing for the TV Times for over nine years. Blogger Phil Beard, at his Notes on the Visual Arts and Popular Culture, also has a nice post on the series. 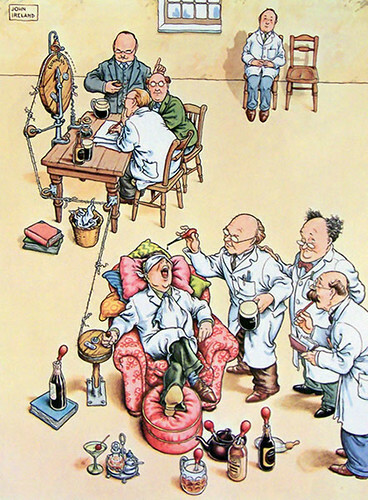 These days John Ireland is best known for his caricatures. I have the 12 prints from that calendar that year. 100% original. They are beautiful! I believe they fetch approximately 90 pounds sterling per month. I’d never sell them! I have the 100% original complete set. They have been kept together protected for the elements. Definately worth £1000, any realistic offers to contact@mattkane.co.uk. £1000 and they are yours. John, I’m not really the person to ask. My interest in them was purely artistic. You’ll want to ask someone involved in Breweriana collecting. There is a Guinness Collectors Club. They may have an idea, too. Hello, I also have a full and framed set of these prints. May I ask, where did you get your valuation as I have been looking to sell them but had no idea of their value. Thanks, Stephen. 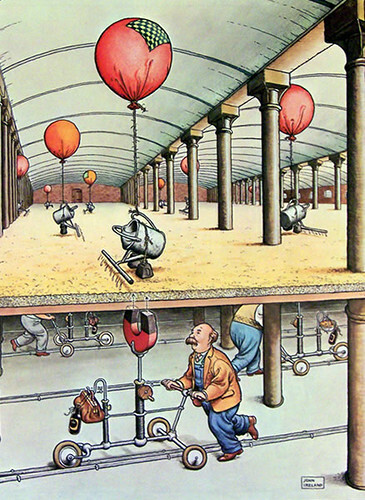 Are these drawings from the 1981 calendar? Um, isn’t that what I wrote in the first paragraph? 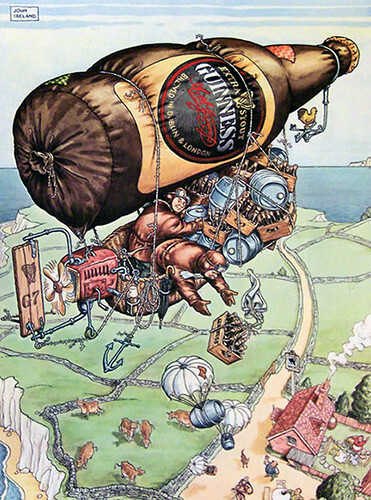 As an ex Guinness Representative I have a complete set of 12 and also a calender with ilustrating the 12 picyures. They are pristine condition and I would like to sell them. Any Offers? Hi there – long shot I know – but are these still available???? If your after these prints. Do you still have the items for sale? 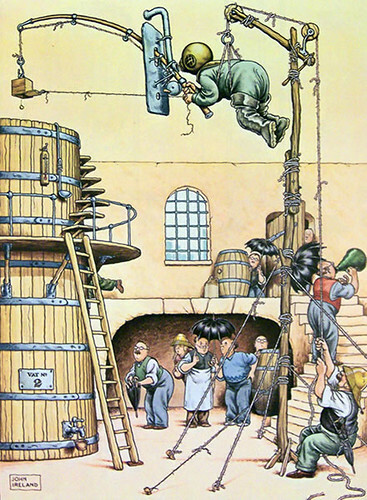 In a recient trip to Ireland I was able to pick up 4 of these prints (8″X10″) at the Guinness Factory but these were all they had. I would love to complete the set. Does anyone know where I can find the rest of the prints in this size? This week on 9th January 2012 in a local auction I saw a job lot of 11 of the prints on hardboard and framed but not under glass. Not seen them before and really liked them. I successfully bid and got the lot for a total of £21.51. I dont know if I was just lucky or they are really of such low value. I hope its the first. Haven’t gone to pick them up yet but when I’ll see which one is missing and will then look out for it. I’m a huge guinness fan. I really wish I owned some of these prints. I have one of these calendars. It is complete with all 12 months and is in good condition on it’s original ring binder. One of the above site comments suggested each month was worth £90, which I think is a bit optimistic. I would sell mine for £60 per month(a total of £720 plus postage), if you are interested. Please e-mail if interested. Thank you. Hi, I have the whole collection. It has been in my position since 1981. 1982 I framed each one in a Aluminium frame’s with matt glass. I am now moving to a smaller apartment and have decided to sell the whole collection. I am in Iceland, so the freight might cost some thing from Iceland to your place, unless you live in Iceland. Thorir Thorisson. Width = 31 cm and Height = 45.5 cm. Please let me know which price you want for the “posters” and if you want to sell, I would like to see a picture of the posters, please. I have a copy of the complete calendar from 1981 which has never been used and is in excellent condition. It has been in a plastic bag for protection for many years. I was given it by a brewery rep in I suppose 1980 and would be interested in any offers from seriouse buyers. 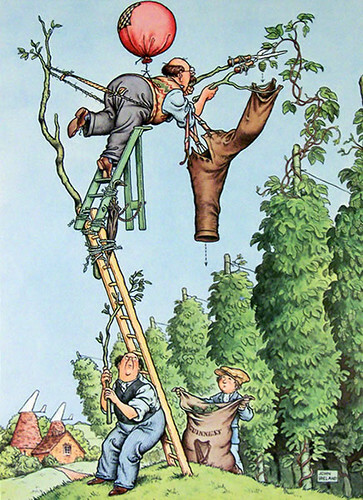 I have a complete set 100% Original Complete Collection of 12 John Ireland The Gentle Art of Making Guinness( Calendar 1981 Prints Jan to Dec) all in 20¾ inches in length x 16¾ inches wide frames ready to be hung. I feel it’s time for them to go because I have not the room to hang them, and I would like someone who will appreciate them and I would be open to a sensible offer. i have a complete set of original The Art of Making Guiness, and a set of excellent copies, anybody interested? would anybody like to make an offer? nice 1981 guinness caledar complete.good cond.open to sensible offers. I have the calendar also but three prints were damaged , How much do you want for the complete calendar ? I was given the 1978 Guinness Calender at the Uxbridge Fare in that year by the Guinness Rep. They are now framed and were hanging in my pub in South Africa. I have now returned to Ireland and if there are any offers, please contact me. I also have two beautiful Guinness mirrors, Framed St. James Gate poster and a Silver Jubilee guinness tankard. Hello i have full set of framed prints for sale in excellent condition making the guinness 1981 by john ireland .. I have a calender of 12 prints 1981 for sale if anyone interested. I got the calendar in 1981 and had each picture framed, in a thin mahogany frame with glass. Make me an offer (the Netherlands). Bobbie – might be gone by now. But I am interested if you still have them! I have 12 framed prints. We had them in our basement hanging on the walls around our pool table and we no longer have a pool table room. The prints are professionally framed in nice black frames. If you are interested please make me an offer. I am located in Sammamish, WA, USA. Hello i have a full set off prints all in frames in excellent condition i am asking £1200.00 for them 2016 prices thank you…. I am interested if they are still available…..
Do you still have them John ? I have a full set of these prints , all mounted , framed and glass fronted ( 1 glass is cracked) . The set is in excellent condition . If anybody is interested please make a offer . I had a full framed set of these and out of the goodness of my heart “donated” them to my local pub – The Tavern Y Felin, Llanelli. Following a change of landlord the “temporary” successor came in and moved on very quickly and “stole” them – if you’re out there I hope you get a good price for them!! 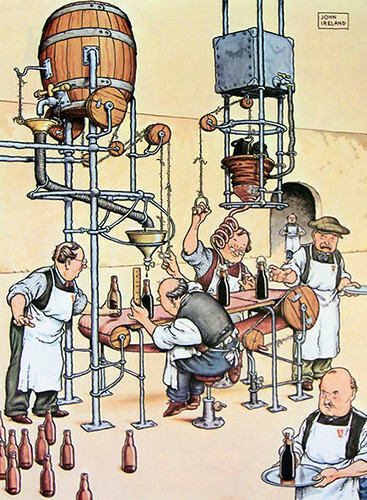 It’s kind of an amused commentary, as I read it, on the fact that high-tech has mostly overtaken a craft in the various operations of the brewhouse. From the consumer’s standpoint, he will get the heritage part, the main message to be sure, but there is this other aspect to I think especially in the last print. Bellows were never used to dispense Guinness but it’s an exaggerated way to show that dispense of draft Guinness was once at a remove from the neat nitro box shown on the bar counter. Circa-1980 was only 20 years – not even for some parts of London – since nitro dispense was brought in. A beer aware person even in his 40’s and 50’s would have remembered how Guinness was served before the nitro days – and may have recalled the wood cask shown in the corner next to the modern metal one. Sorry, I meant “some parts of Ireland” (not London). Have a full Original set of 12 months !!! size 12 ” * 17 1/2″ . all pristine condition !!! any offers ? Are you still looking for your missing months? I have a full set and may consider splitting them for a reasonable price. I am moving house and cannot take them with me, I’d really prefer to find a buyer who is a genuine collector so I know they get a new home where they will be appreciated, but if not they will go on gumtree or ebay for best offer. I have a complete mounted and framed set – no watermarks or staining, pretty much pristine condition. Would consider selling if right offer was made. 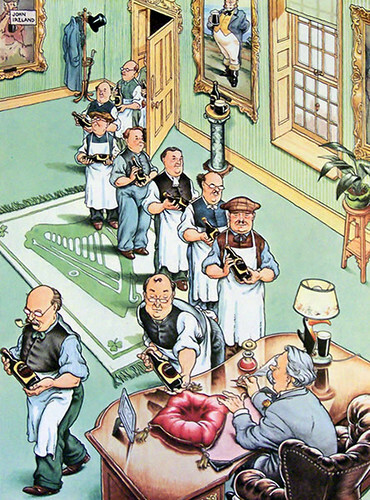 I have the full set of John Irelands caricature prints 18 x 12 the art of making guinness, they are still in the original package, it is my intention to sell them asap, i don”t really want to go to auction but am looking for only sensible offers no time wasters please. I was gifted with the original 1981 gentle art of making guinness prints in the the original black guinness folder about 15 years ago.They have not been exposed to light and are in emaculate condition and for sale at a sensible offer. I have a full set of the John Ireland 1981Guinness Calendar they are framed but there is fading related to age and hanging on a wall. Is anyone interested in making an offer? I have a complete unmarked 1981 Calendar all months. Pristine condition. It’s for sale due to downsizing. I also have a stack of other stuff, from glasses, fonts, commemorative bottles etc. I have a full set of the prints but they are mounted on some sort of very heavy black mount. I am looking to sell these but have no idea of value. Anyone interested please reply. They came from a local pub. 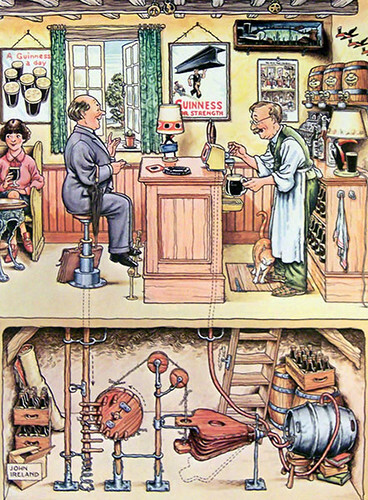 I have the original full set of john Ireland 1981gentle art of making Guinness.They are in great condition no discolouring and are still in the black Guinness folder.all all prints are flat no kinks anywhere .I am looking for 80 quid a print. I have a complete set of the prints. All framed. 6 with one type of moulding and the other 6 also framed. John hughes i left a comment 24th jan 2015 and i stil havel the original john ireland the gentle art of making guinness in the guinness black folder hey have been kept dry and away from the elements they are beatiful .Make me an offer i cant refuse. love the series and seeking all of them, does anyone know where I can purchase them, to frame for my house? michael yes i have the original set of the gentle art of making guinness.They are fantastic condition away from ligh and are in the original black guinness folder.